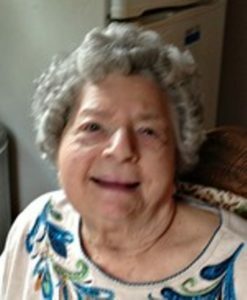 Carver – Martha M. (Michalak) Niedzwiecki, 95, of Carver, longtime resident of Shrewsbury, died Jan. 11, 2019 at Beth Israel Deaconess Hospital in Plymouth after an illness. She was born and raised in Shrewsbury, daughter of the late Ignaz F. “Jerry” and Helen (Kasprzak) Michalak. Martha graduated from Shrewsbury High School with the class of 1942 and continued her education at a Secretarial School, receiving a completion certificate in 1943. In 1945, She met and married Chester F. Niedzwiecki, together they made their home in Shrewsbury for many years before moving to Carver in 2005 to be closer to their daughter. They celebrated 66 wonderful years of marriage before he passed in 2011. Martha worked as a payroll clerk for American Steel and Wire in Worcester for many years before she retired in 1961. When living in Shrewsbury, Martha was a devout member of Saint Anne’s Parish where she was active in the Women’s League and was the Parish Organist in the 1940’s thru the 1950s. Martha leaves her loving daughter, Ann Frazier and son-in-law Doug Frazier of Carver, and a brother, Charles Michalak of Worcester and is also survived by many cousins, nieces, nephews, and friends. Beside her husband, Martha was predeceased by five siblings, Theodora Misiewicz, Frances Chicoine, Walter Michalak, Jenny Michalak, and Timothy Michalak. Martha’s family would like to thank the compassionate and loving caregivers Roz and Roberta for all of their time and consideration given to Martha and the family during her final journey. Friends and family are invited to attend calling hours Tuesday, Jan. 15, from 4-7 p.m., in the Britton-Shrewsbury Funeral Home, 648 Main St., Shrewsbury. Her funeral will be held Wednesday, Jan. 16, with a funeral Mass celebrated at 10 a.m. at Saint Anne’s Church, 130 Boston Tpke., Shrewsbury. Burial will take place next to her husband in Mountain View Cemetery of Shrewsbury. In lieu of flowers, memorial donations may be made to Cardinal Cushing Centers, 405 Washington St., Hanover, MA 02339.